Curvaceous full swirl cream serum was launched by the design house of red ken. It is recommended for daily use. Please store in a cool dry place. Curvaceous full swirl cream serum by red ken for unisex, 5 ounce serum. 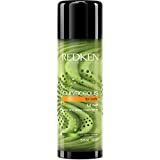 Interested in the Redken Cream Serum, Curvaceous Full Swirl, 5 Ounce? Is the price too high? You can easily price watch this product and we'll notify you when the price reaches your target.